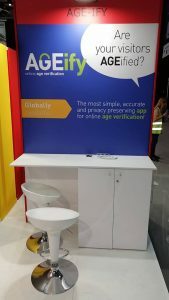 AGEify, our innovative solution for online age verification, participated in MWC 2019, in Barcelona. The event was held from 25 to 28 February 2019 at Fira Gran Via. MWC Barcelona is the biggest mobile event in the world, in which professional speakers and more than 2.400 leading companies, representing big consumer brands, take part each year. This year in particular, a variety of events were held at the MWC, such as the global business platform for tech start-ups which included workshops, conference sessions and competitions; also the Mobile World Summit, a meeting between top executives with speeches, discussions and networking opportunities. The participants also had the chance to attend GSMA Seminars, which were presented by specialized people who know all the essential industry developments and themes. The main theme of the event this year was ‘’Intelligent Connectivity’’, which concerns the powerful combination of flexible, high speed 5G networks, the Internet of Things, Artificial Intelligence and Big Data. 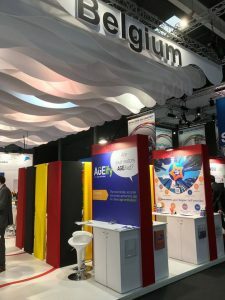 The AGEify team joined in the MWC 2019 and had the opportunity to increase its business knowledge, expand its professional network and get more into the technology field. It’s important to mention that AGEify works like a passport. Our innovative application constitutes an easy, accurate and privacy-preserving manner, which via several methods enables the verification of any age, including that of minors. Currently, the first version of our solution is already available and we are looking for partners to use it and expand it internationally.